CCMI is a pioneer in the Cayman Islands in coral restoration. 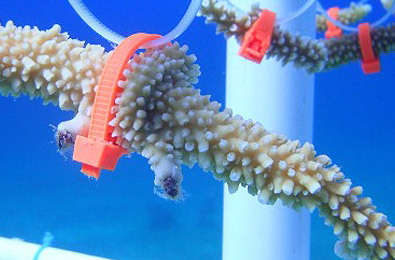 In 2012, a pilot study was established to explore the potential for coral nurseries. With results from this work, the Cayman Islands Department of Environment passed new policy and coral nurseries have spread across the islands, with 5 private entities currently growing coral as a result of CCMI’s work in this area. This project seeks to have a long-term positive impact on the preservation of corals which provide the framework for all coral reefs. 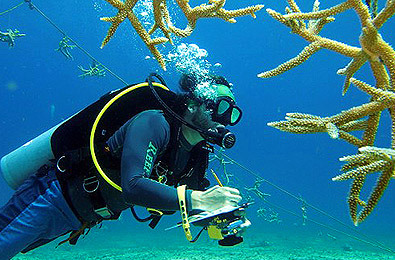 As with many coral restoration programmes, the staghorn coral (Acropora cervicornis) is ideal to use, due to its ease of fragmentation and growth, and it’s endangered status. The ultimate goal of coral regeneration is to help nature nurture itself. To do this, outplanted corals need to establish a viable, locally connected, sexually reproductive population. The more genetically diverse the nursery-reared outplants, the better. When fragments were collected from five parent colonies in 2012, it was unknown if these came from genetically distinct parents or from genetic clones. Fragments were tagged and kept separate from one another within the nursery until genetic analyses could be performed. Recent results from genetic work on an additional 100 corals from across the three Cayman islands by University of Miami scientists (Dr. Diego Lirman and PhD candidate Crawford Drury) has led to a new understanding of the connections of the species across the region. Cayman and Florida corals show the closest relationship and new maps for improving the protection and management of threatened coral species are now in progress. This information will not only help coral nursery managers and stakeholders to select unique donor colonies, but will also assist in guiding future outplant strategies. Results from the collaborative genetics sampling study were used to create the first map of staghorn coral genetic distribution in the Cayman Islands. 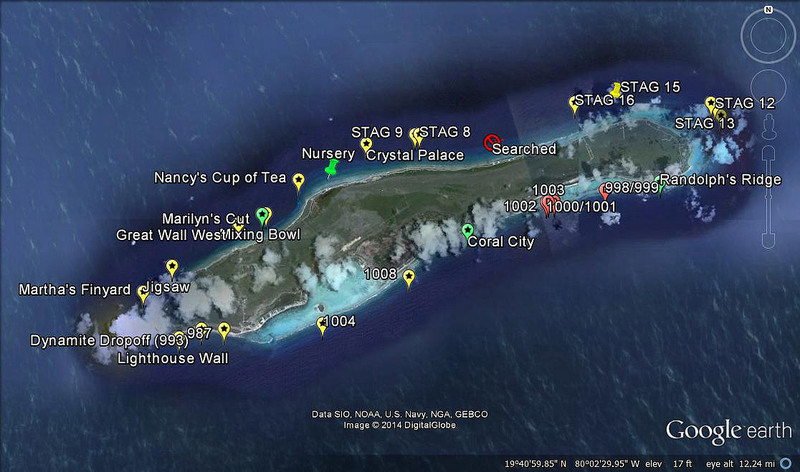 Below is the map for Little Cayman, with each yellow dot representing a genetically unique staghorn coral colony. Propagation of 1000+ coral fragments starting from 10 parent colonies. The expansion of the nursery into a shallow water nursery located at 20ft of depth and a deep water nursery located at 60ft of depth. The deep nursery offers a site removed from storm activity and actually requires less maintenance than the shallow nursery. Nursery expansion from 1 to 15 coral “trees”, each with 100 fragments capacity. Nursery expansion and space for 15 lines to which fragments may be transferred as they outgrow the trees. 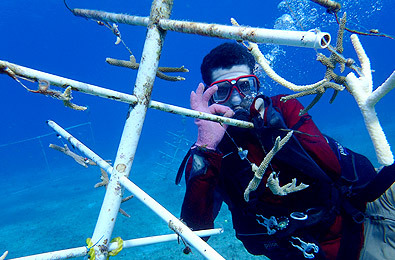 Nursery expansion with the introduction of 12 coral “frames”, six in the shallow water nursery and six in the deep water nursery; each has the capacity to hold 50 fragments. Lessons learned were written into the first National Coral Nursery Policy by the Cayman Islands Department of Environment which was approved by the Cabinet in November of 2014. CCMI’s improved coral fragmentation method was published in the Endangered Species Research scientific journal and presented at the Benthic Ecology Meeting (2014) in Jacksonsville, FL. CCMI has already returned 1000+ nursery-reared staghorn corals to the wild at 10 sites around Little Cayman. Each outplanting site is chosen to answer a scientific question and several publications have resulted. With over 1000 corals of at least 10cm in size (TLE), nursery-reared colonies contributed over 10,000+ cm (100 m) of additional staghorn coral tissue to the wild. Outplanting sites are monitored for at least five years and the success of these sites has been mixed. More work will be conducted in the coming years to understand what makes a successful outplanting site. Deep Water Strategies: Results will help us determine how deep our shallow nursery-reared corals can be outplanted. Shallow Water Strategies: Results will help determine whether it is possible to regenerate the shallow waters of lagoon reefs and backreef areas where staghorn and elkhorn corals once thrived. Biodiversity Recruitment: Results will identify structural preferences of early settlers (fish, shrimp, other reef creatures) to help improve the design of outplant plots. 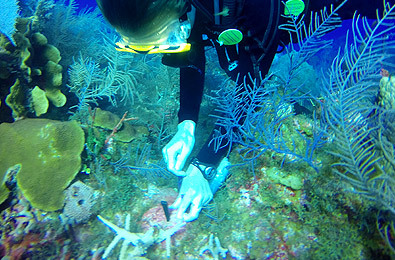 CCMI is the primary research site for stony coral restoration throughout the Cayman Islands. As we are fine-tuning our work using staghorn coral, we have begun work with elkhorn coral (Acropora palmata), another Evolutionarily Distinct and Globally Endangered (EDGE) species. The goal is to sample 150 elkhorn coral colonies to determine whether they are genetically distinct. 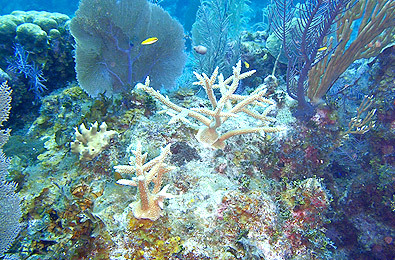 The Little Cayman Nursery is permitted by the Department of Environment, under the auspices of the National Coral Nursery Policy. The Disney Worldwide Conservation Fund, The Dart Foundation, Ernest Kleinwort Charitable Trust, Caribbean Water Company, The Darwin Plus Initiative.